16th of june was booked since a couple of weeks back. Me and Fredrik found one single night we were able to go fishing together. It turned out to be a very beautiful evening as we arrived to the coast at sunset. 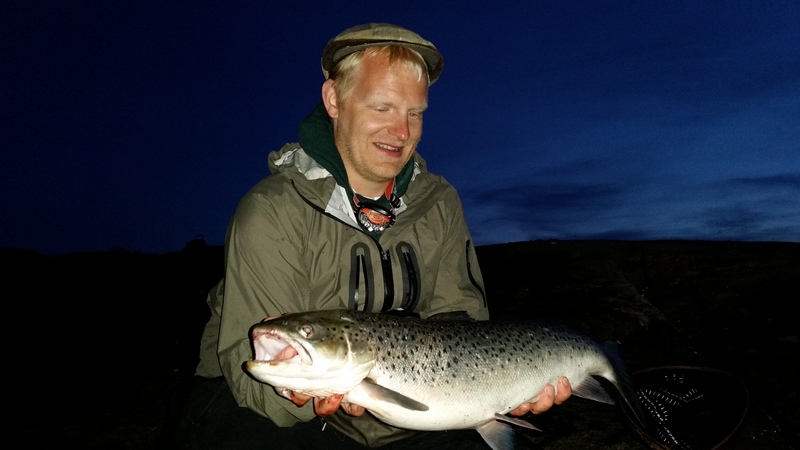 Our friend Joel joined us and we were looking forward to the night fishing for sea trout. These midsummer nights have been good and we had a good feeling about the trip. When we got to the shore we saw that the water lever was very low and the wind was blowing from the “wrong” direction. Maybe it wasn’t going to be as good as we expected after all. After some casts, coffee and sandwitches we had landed a couple of trout babies but saw nothing bigger. Then at the darkest hour Fredrik found a couple of feeding fish and was eagerly casting on those. He put on a really slim, simple fly and tried to present it very slowly. That seemed to be the trick. He lost one good fish and a missed a couple of strikes, but after a moment he landed a beautiful, big seatrout around 2,5 kilos. He handed the fly over to me – I was working on another fish that had been up on the surface. Moments later, I managed to hook that one and land a pretty, fat seatrout around 1,5 kilos. The night was turning out to be really good after all. As the activity went down and I started to freeze, I took a walk to another spot that I knew often held good fish. I didn’t see anything in the surface and started blind casting. After a few casts something took the fly and I realized it was a trout way bigger than the one I landed earlier. Fredrik and Joel saw that I might needed help and rushed to me with the net and a camera. As the fish finally was landed, we saw what a beast it really was.